For ecommerce and retail websites, reporting on revenue, product information and sales is essential to benchmark how the site is performing. 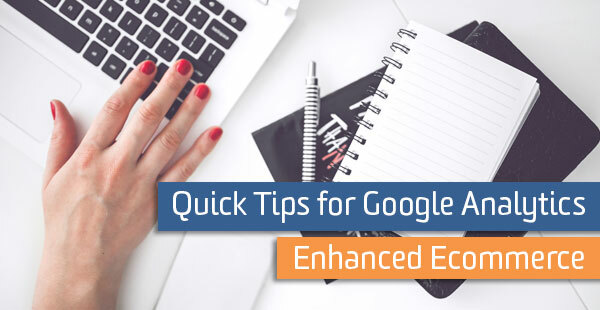 If you’re not using the Enhanced Ecommerce features for Google Analytics yet, check out our FAQ! Or, if you’re in the implementation phase, there is a great way to test using Data Layer Forensics by Dorcas Alexander. If you’ve already made it past the implementation phase (congrats!) it’s time for the fun part. Just like any of the other reports in Google Analytics, there are opportunities for cleaner data and granularity to super-charge your reports. Below are some tips to help get more out of Enhanced Ecommerce. It’s important to have consistent field values for everything. This seems like a simple tip- it may be easy to avoid splitting product rows by making sure “Purple Striped T-Shirt” is populated on each action and step with the same capitalization and characters. However, sometimes this is not as apparent. For example, what if the product detail page for “Purple Striped T-Shirt” has a dropdown to choose Men’s or Women’s before adding to cart and both have their own SKU? We don’t want the product detail view to be attributed to only one of those options, since this product detail page should count as a view for both products. It’s not ideal to send it upon choosing an option because we want to analyze the ‘just browsing’ product detail views to track Cart-to-Detail and Buy-to-Detail rate over time. The users who choose an option are arguably further down the funnel and we want to have a broader picture with our data. Therefore, on this page load, we would send a product detail action with both products. Overall, you may notice that either name or SKU (ID) are required when implementing ecommerce tracking. However, it’s important to have the values of both fields sent with transactions, checkout steps and all user actions. 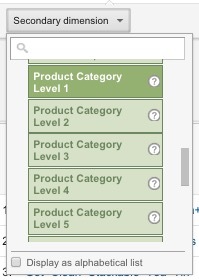 Google Analytics won’t match these automatically. For example, if you just have the SKU available for the product detail page, but for Add to Cart have both SKU and name, the Add to Cart will not show up when analyzing with Product Name as the primary dimension or in the Product Performance view. 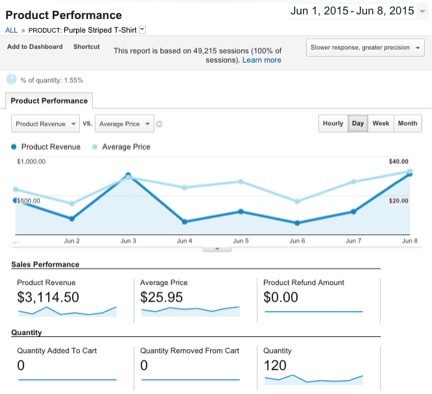 By using Google Analytics’ Data Import feature, Product SKU and Product Name can be automatically matched. This is perfect for implementations where the name isn’t available for all ecommerce steps and actions. It’s also great if the product names aren’t coming into Google Analytics the way you want to see them in your reports. For example, maybe “Purple Striped T-Shirt” is coming in as something like “purple+striped%20+t-shirt55214.” All we would have to do in this case is upload a spreadsheet in the Data Import section (property-level) with 2 columns- one with all of the SKU’s and one with the Product Names we want those SKU’s to show up as in the interface. Once the dataset is successfully uploaded, the product name will be overwritten from that point forward. Or, if you use Google Analytics Premium, you have the option of viewing historical data with the new product names with Query Time. In fact, as long as the SKU is available on page load, data import can be used for uploading other dimensions like brand, variant and product categories. No extra coding is required to broaden your tracking and reports- just preparing and uploading a spreadsheet. If those still are not enough fields to get the details you need in your reports, there is also an option of sending custom dimensions and metrics with the ecommerce data. 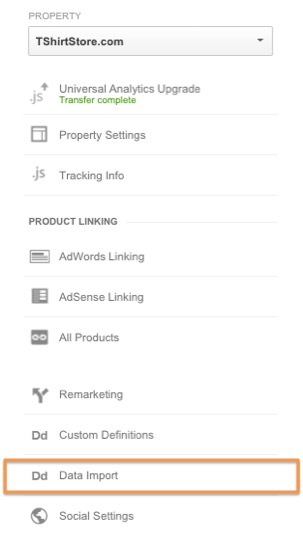 Along with user-, session- and hit-scoped dimensions, Google Analytics also has the product scope. So now that we have “Clothing/Casual/Shirts/Womens/Petite” and possibly “Purple” as the variant, we can add custom dimensions for more detail like “Medium,” “Summer 2015 Collection,” and “Stripes and Plaids.” Custom metrics are also available to implement metrics like cart value. Your only limit is the amount of open slot indices that are available in your property (there is a max of 20 for standard accounts and 200 for Premium). Product-level custom dimensions and metrics as well as the category hierarchy can either be added to the on-page ecommerce code or added with data import. With data from consistent field values, data import, product hierarchy and product-level custom dimensions, you’ll have more cohesive reporting and more opportunities for catching trends and insights. Not only will these points be useful for standard and custom reports, but you will be able to use the dimensions throughout in advanced segments, custom alerts and view filters.